Improve Sleep Quality by Floating? All of us have experienced the consequences of a sleepless night. Everything the next day requires more effort. You lack energy and motivation. You feel groggy and irritable. Scientists are still trying to understand the depths and purpose of sleep. It is the current belief that sleep re-energizes the body's cells, clears waste from the brain, and supports learning and memory, but there is still much to learn. There must be a good reason, as we spend about 33% of our life sleeping.. It is now also understood has that sleep is regulated. There are mechanisms in our brain that affect the duration and depth of sleep during a 24 hour circadian rhythm. Sleep loss or chronic sleep disruption of this rhythm can affect stress levels, metabolism, immune function and a number of physiologic processes. Sleep has been of significant interest to the floatation therapy industry as evidenced by thousands of anecdotal instances of improved sleep after floating. While floating, like sleep, you are essentially "offline". with minimal to no external stimuli. Both floating and sleep require sensory disconnection as an essential requirement. Many floaters actually do fall asleep during part or all of their float. Most are somewhere in between sleeping and wakefulness. Being in an intensely relaxed state while floating effortlessly atop 10” of skin temperature water filled with 1000 pounds of epsom salt (Magnesium Sulfate) appears to mimic various stages of sleep and functions to restore sleep deprivation and to assist the brain in the same way as a restful sleep with both REM and non-REM stage sleep. 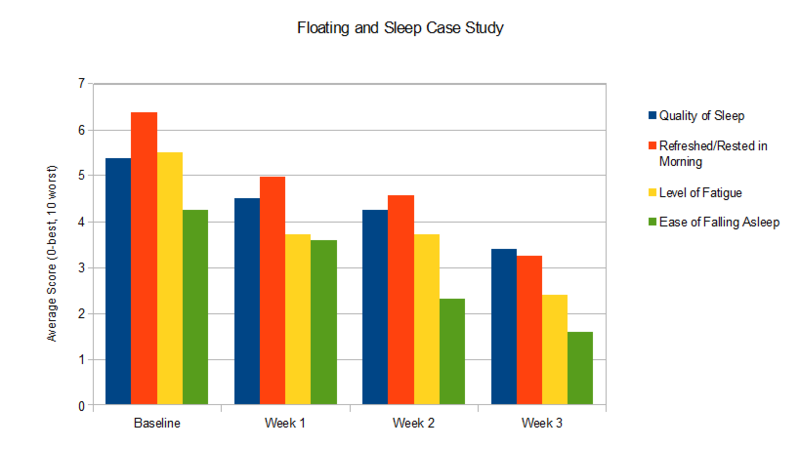 Recent case studies at The Float Zone in Richmond, VA have tracked sleep quality along with other parameters. Our studies have demonstrated that there is qualitative improvement in one’s sleep, leading to improvements in many other physical and emotional areas. Further, float frequency made a difference on improving the subjects' quality of sleep. While both groups - those who floated once/week and those who floated twice/week - showed improvement on quality of sleep, there was a more pronounced effect on the twice/week group. The results reflect that sleep quality improved when subjects floated once a week for three weeks. Thus, while science is still discovering the wonders and benefits of sleep, you can rest easy knowing that sleep can be improved through floatation therapy. Read the Case Study Abstract or contact the author, Dr. David Berv, for more information on floating and chronic pain. For more information on our case studies please visit The Float Zone's Case Study Page.